Spinner Wheels or In-Line Fixed Wheels? 2 Wheels Or 4 – Which Is Your Preference? If wisdom is any indication, then clearly more is more. If you have to choose between 4 wheels and 2 wheels, your basic instincts will kick in and you would want to choose the one with maximum number of wheels in your luggage bag. However, the choice between 2 and 4 wheels has a lot to do with travel preference than mere number of wheels on your luggage piece. In this article, we will discuss both the options in detail so that you can make an informed choice. Spinner luggage bags come with 4 wheels that feature two wheels on each corner of the bag. This offers stability and requires less force from you to move it from one place to another. Thanks to its 4 wheels, the suitcase is able to stand on its own. Let us talk about its pros and cons to understand it better. As mentioned before, the 4 wheels on your bag keep it perfectly balanced and distribute the weight uniformly. This ensures that the bag is stable and doesn’t tip over to the other side. More wheels mean that they offer ease of mobility. These bags work like a charm on smooth airport floors where you can drag the bag with a light touch or even your finger. They are ideal for urban settings and can be easily navigated through escalators or even crowded terminals. It is incredibly easy to have complete control over the bag, despite its 4 wheels. The bag size may not always include the wheels on the label. This is why you have to know the exact measurements of your bag to avoid any excess fee. With higher number of wheels, the probability of wear and tear also increases significantly. One of the wheels may act up and leave you with an unbalanced bag. Even though it is ideal for smooth floors, it may not work that well on uneven surface such as brick roads, pavements, cobblestone streets etc. Your biggest challenge to pull the bag will be if you are met with a broken lift or an escalator. Dragging this bag through the stairs will not be a pretty picture. Lugging your bag at that time can be a pain and make you regret all the extra pair of shoes you carried for no reason. The biggest problem with the spinner wheel luggage bags is that they cannot be tilted when you want to drag them quickly. They will only work best when they are on a levelled floor, unlike the 2-wheel option that can be tilted and rolled. This can be a huge issue when you are in a rush and every second counts. The wheels on this bag are usually made of polyurethane, a plastic material that is known for its durability. Equipped with two or three wheels, it can be easily dragged. It also has a stopper on one side, allowing it to stay put when needed. However, most of these bags can only be hauled from behind, but they can easily pull through on all kinds of surfaces. In-line wheels are less bulky for the bags. If you are an active traveller, you will understand the importance of handles and their ability to pull the bag effectively. 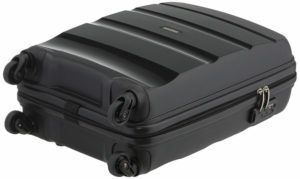 You can also put your small carry on bag on top of your suitcase and simply allow the gravity to do its magic for you. You will not only be able to easily drag both the bags but also do so with minimal effort. Its ability to function seamlessly even on uneven ground makes it a game changer for lot of travellers. Not everyone has the fortune to travel through airlines. Sometimes you also have to drag your suitcase through potholed roads and cobbled streets. That is when you will say a silent prayer for your suitcase that can work efficiently. You will be able to heave your bag with two wheels and keep the contents of your bag safe. Even though taking a bag through the staircase may not be effortless, it is still much easier than the spinner wheels. Two wheeled bag is much easier to tackle in this situation. One of the biggest advantages of using in-line wheels is that they are much faster to pull than its counterpart, spinner wheels. Just lean the bag and make a dash for the security gates. This little feat will make all the difference between you making the flight or missing it. If you are someone who is used to packing a huge bag, then you are in for a disappointment. These bags can tip over due to lack of weight distribution. This can be a problem especially when you are trying to stand your bag up straight. The suitcase may not be able to hold on its own without support. The wheels can get ruined if not maintained properly. Imagine dragging your bag through the dirt road and hitting the underside with a rock! It can damage the bag and render it useless for the rest of the trip, at least the wheel part. This bag is designed to be pulled only, which means that you will not be able to comfortably push the bag, if needed. When put the two bags against each other, it really just comes down to your own preference and travel style, rather than picking a favourite. Each option clearly has its own advantages and choosing between the two largely depends on how you travel. If you are still contemplating between the two, it is advisable to stop at a local luggage store and weigh your options clearly before investing in one.